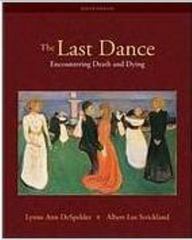 The Last Dance: Encountering Death and Dying 10 Edition The Last Dance: Encountering Death and Dying provides a comprehensive, up to date, and readable introduction to the study of death and dying. It directs attention to the evolving understanding of death and dying in today's culturally diverse environment. In a straightforward, conversational style, with an extensively illustrated format, The Last Dance provides a solid grounding in theory and research as well as in methods for applying what is learned to readers' own circumstances, both personal and professional. No other textbook so successfully combines the research and theories of such diverse disciplines as anthropology, art, ethics, health science, literature, philosophy, psychology, public policy, religion, and sociology. The tenth edition of The Last Dance includes new coverage of key topics yet retains the focus, writing, and pedagogy instructors have come to expect from the best-selling text in death studies.